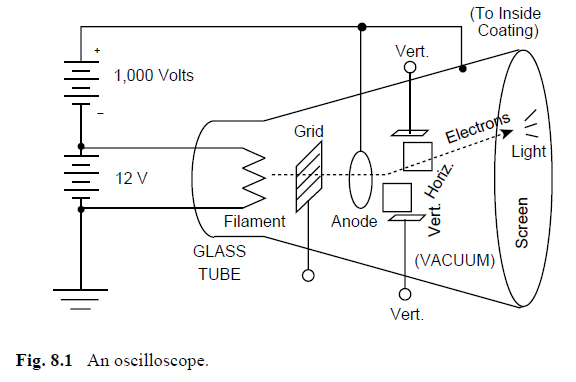 The most important part of an oscilloscope is a large, cone-shaped glass tube with a vacuum inside. It operates the way the old "vacuum tube" radios worked, before the invention of transistors. That is, there is a tungsten wire "filament" at the small end, which is heated by a low voltage but high current source, which could be a battery. Electrons tend to fly off this hot wire, almost like vapor from a boiling liquid. The battery and filament assembly is the left-hand part of Fig. 8. Some of the electrons get collected by the "anode" hoop and returned to the battery, but many are going so fast that their momentum tends to keep them going to the right, rather than changing direction quickly enough to get caught by the hoop, so they fly through the large hole in the middle. Since the beam of electrons is coming from the negatively charged filament (the "cathode" of the 1,000V circuit), this beam is called the "cathode ray." The whole tube is sometimes called a "cathode ray tube," or "CRT." It can be an important part of a TV receiver, in which case it is called the "picture tube." The electrons continue until they eventually hit the "screen," which has a thin coating of "phosphor" material, such as zinc silicate. This contains impurities that convert the kinetic energy of the electrons into a visible spot of light, and that can be seen outside, through the glass tube. The inside of the tube also has a thin conductive coating on it, to carry the electrons back to the power supply. A grid of thin wires is attached to a "terminal" outside the tube (the small white circle), and if a strong negative voltage is applied to the grid, it can stop or at least decrease the intensity of the visible light spot. This is not always used in an oscilloscope, but it is an important part of a TV picture tube. Four metal plates are on the top, bottom, and sides of the tube, and they are all connected to outside terminals (only two of which are shown in this diagram, for simplicity). If the top one is slightly charged + and the bottom one –, via the "vertical" terminals, the electron beam (cathode ray) is attracted upward, as shown in the diagram, and the spot of light thus appears up high on the screen. Similarly, if the "horizontal" plates are charged by some outside voltage, the spot will move to the side (not shown here). Electromagnetic interference (EMI) is a double-acting problem. Especially in military usage, equipments must not radiate interference beyond levels allowed by specifications nor be affected by defined levels of external interference. These levels are defined for both radiated and conducted levels. Radiated interference into and out of equipment can usually be thwarted by good grounding techniques and shielding of critical circuits. Interference conducted by supply, control, or load wiring may require the installation of low-pass traps such as shown in Fig. 5.4. A “T” section of this sort will reduce conducted noise in both directions, into and out of the equipment. Local EMI can cause problems with instrumentation. 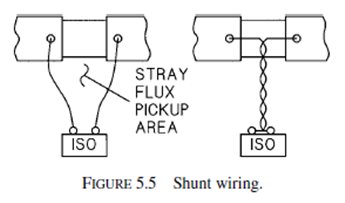 Shunts are often used to measure DC current levels and occasionally for AC. 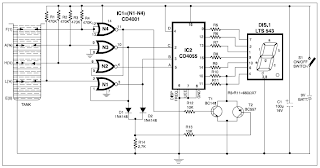 Isolation amplifiers are used to amplify the shunt output voltage that is usually in the 50 to 100 mV range. Difficulties may arise if care is not taken with the lead dress to the shunt, especially if the power circuit has a high ripple level. Figure 5.5 shows the nature of the problem. The lead dress at left provides a large loop that magnetic fields can penetrate and induce spurious voltages. At right, the leads have been twisted to minimize the loop. Even with twisted leads, there is a less obvious loop caused by the thickness of the shunt itself. 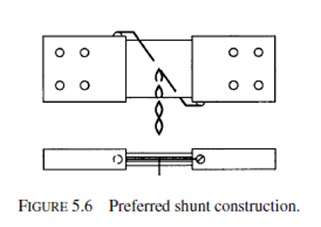 The shunt should be made such that the terminals are symmetric about the geometric center of the shunt, and this requires an even number of leaves and location of the terminals on opposite sides of the shunt body and opposite ends of the leaves. 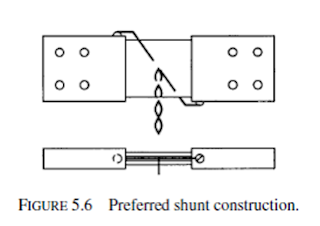 Figure 5.6 shows a recommended shunt construction that several vendors are willing to make at a small premium in price. Even with these precautions, it is not always possible to eliminate all stray pickup in circuits with AC or high-ripple currents. 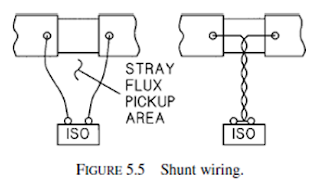 However, contaminating signals can be neutralized with an air core pickup coil of a few turns connected in series with the shunt output. The location and orientation of the pickup coil must be determined experimentally. The precautions on shunt metering apply also to oscilloscope measurements of low-level signals in the presence of interference. The ground lead of the scope should be looped back and forth along the probe to minimize the loop area and the resultant induced voltages. Nearly all systems in power electronics rely on feedback control systems for their operation. This chapter presents the basic analog analysis of such systems because, in this author’s opinion, it offers a more intuitive understanding of their behavior than can be obtained from modern control theory with digital techniques. Many systems require nested control loops to control several variables. One example is a DC motor drive that must have a very fast current control loop to limit the armature current but also requires a voltage loop for speed control. The voltage control cannot override the current loop, but it will set the required current so long as it is within the limits set by the current loop. In short, the voltage or speed loop commands the current that is required to satisfy the voltage, but the current loop sets the current limit. Both loops must be unconditionally stable. Figure 4.9 shows a typical system. The armature current is regulated by feedback from a current shunt and isolator amplifier. The frequency of such a current regulator using SCRs can have a crossover as high as 1000 radians/sec, but 500 radians/sec is easier to handle and less critical on feedback. If the current loop is set up for 500 radians/sec, the voltage loop must, generally, crossover at a decade lower in frequency, 50 radians/sec, for stability on a 50- or 60-Hz system. As costs of electronics decline, the power supply becomes a larger fraction of system cost and design effort. One major manufacturer estimates that power supply cost will soon reach 50% of the total cost of a typical electronic product such as a cordless telephone or personal computer. Thus, new technology developments in power supplies are critically important. In the past, bulky linear power supplies were designed with transformers and rectifiers from the ac line frequency to provide low-level dc voltages for electronic circuits. Late in the 1960s, use of dc sources in aerospace applications led to the development of power electronic dc-dc conversion circuits for power supplies. In a typical power electronics arrangement today, an ac source from a wall outlet is rectified without any transformation; the resulting high dc voltage is converted through a dc-dc circuit to the 5V, 12 V, or other level required. These switched-mode power supplies are rapidly supplanting linear supplies across the full spectrum of circuit applications. A personal computer commonly requires three different 5V supplies, two 12 V supplies, a ÿ12 V supply, a 24 V supply, and perhaps a few more. This does not include supplies for video display or peripheral devices. Only a switched-mode supply can support such complex requirements without high costs. The bulk and weight of linear supplies make them infeasible for hand-held communication devices, calculators, notebook computers, and similar equipment. 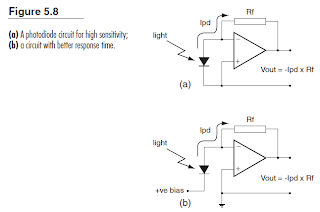 Switched-mode supplies often take advantage of MOSFET semiconductor technology. Trends toward high reliability, low cost, and miniaturization have reached the point at which a 5 V power supply sold today might last 1,000,000 hr (more than 100 yr), provide 100Wof output in a package with volume <15 cm3, and sell for a price of <$0:30 watt. This type of supply brings an interesting dilemma: the ac line cord to plug it in actually takes up more space than the power supply itself. Innovative concepts such as integrating a power supply within a connection cable will be used in the future. Device technology for power supplies is being driven by expanding needs in the automotive and telecommunications industries as well as in markets for portable equipment. The automotive industry is making a transition to 42 V systems to handle increasing electric power needs. Power conversion for this industry must be cost effective, yet rugged enough to survive the high vibration and wide temperature range to which a passenger car is exposed. Global communication is possible only when sophisticated equipment can be used almost anywhere. This brings a special challenge, because electrical supplies are neither reliable nor consistent throughout much of the world. While in North America voltage swings in the domestic ac supply are often < #5% around a nominal value, in many developing nations the swing can be +/-25%—when power is available. Power converters for communications equipment must tolerate these swings, and must also be able to make use of a wide range of possible backup sources. Given the enormous size of worldwide markets for telephones and consumer electronics, there is a clear need for flexible-source equipment. Designers are challenged to obtain maximum performance from small batteries, and to create equipment with minimal energy requirements. In standard broadcast (AM), stations in the U.S. are classified by the FCC according to their operating power, protection from interference, and hours of operation. A Class A station operates with 10–50 kW of power servicing a large area with primary, secondary, and intermittent coverage and is protected from interference both day and night. These stations are called clear channel stations because the channel is cleared of nighttime interference over a major portion of the country. Class B stations operate full time with transmitter powers of 0.25–50 kW and are designed to render primary service only over a principal center of population and contiguous rural area. Whereas nearly all Class A stations operate with 50 kW, most Class B stations must restrict their power to 5 kW or less to avoid interfering with other stations. Class B stations operating in the 1605–1705 kHz band are restricted to a power level of 10 kW daytime and 1 kW nighttime. Class C stations operate on six designated channels (1230, 1240, 1340, 1400, 1450, and 1490) with a maximum power of 1 kW or less full time and render primarily local service to smaller communities. 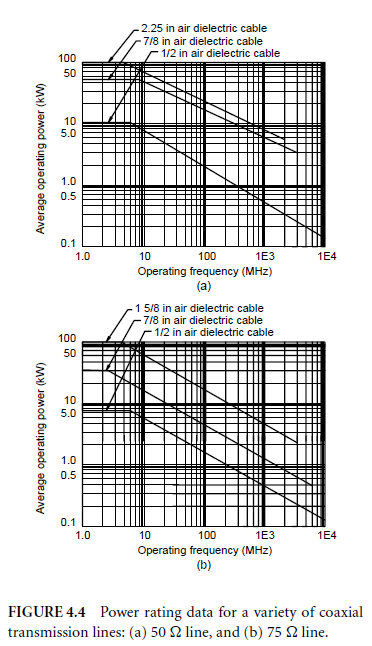 Class D stations operate on Class A or B frequencies with Class B transmitter powers during daytime, but nighttime operation, if permitted at all, must be at low power (less than 0.25 kW) with no protection from interference. Although Class A stations cover large areas at night (approximately a 1000 km radius), the nighttime coverage of Class B, C, and D stations is limited by interference fromother stations, electrical devices, and atmospheric conditions to a relatively small area. Class C stations, for example, have an interference-free nighttime coverage radius of approximately 8–16 km. As a result there may be large differences in the area that the station covers daytime vs. nighttime. With over 4900 AM stations licensed for operation by the FCC, interference, both day and night, is a factor that significantly limits the service stations may provide. In the absence of interference, a daytime signal strength of 2 mV/m is required for reception in populated towns and cities, whereas a signal of 0.5 mV/m is generally acceptable in rural areas without large amounts of man made interference. Secondary nighttime service is provided in areas receiving a 0.5-mV/m signal 50% or more of the time without objectionable interference. Table 16.1 indicates the interference contour overlap limits. However, it should be noted that these limits apply to new stations and modifications to existing stations. Nearly every station on the air was allocated prior to the implementation of these rules with interference criteria that were less restrictive. Note: SC = same channel; AC = adjacent channel; SW = skywave; GW = groundwave; RSS = root of sum squares. to that station’s RSS using the 50% exclusion method may make changes not to exceed their present contribution. contributing value that is below the pertinent value specified in the table. cSkywave field strength for 10% or more of the time. For Alaska, Class SC is limited to 5 μV/m. Source: FCC Rules and Regulations, revised 1991; vol. III, pt. 73.182(a). Here is a simple circuit to obtain variable DC voltage from 1.25V to 15.19V in reasonably small steps as shown in the table. The input voltage may lie anywhere between 20V and 35V. The first section of the circuit comprises a digital up-down counter built around IC1— a quad 2-input NAND schmitt trigger (4093), followed by IC2— a binary up-down counter (4029). Two gates of IC 4093 are used to generate up-down logic using push buttons S1 and S2, respectively, while the other two gates form an oscillator to provide clock pulses to IC2 (4029). The frequency of oscillations can be varied by changing the value of capacitor C1 or preset VR1. IC2 receives clock pulses from the oscillator and produces a sequential binary output. As long as its pin 5 is low, the counter continues to count at the rising edge of each clock pulse, but stops counting as soon as its pin 5 is brought to logic 1. Logic 1 at pin 10 makes the counter to count upwards, while logic 0 makes it count downwards. Therefore the counter counts up by closing switch S1 and counts down by closing switch S2. The output of counter IC2 is used to realise a digitally variable resistor. This section consists of four N/O reed relays that need just about 5mA current for their operation. The switching action is performed using BC548 transistors. External resistors are connected in parallel with the reed relay contacts. If particular relay contacts are opened by the control input at the base of a transistor, the corresponding resistor across the relay contacts gets connected to the circuit. 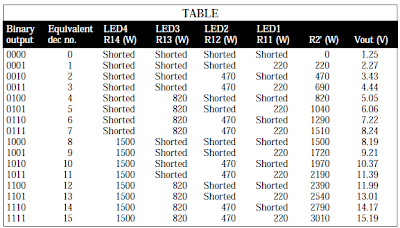 One can use either the binary weighted LED display as indicated by LED1 through LED4 in the circuit or a 74LS154 IC in conjunction with LED5 through LED20 to indicate one of the 16 selected voltage steps of Table I. The input for IC4 is to be tapped from points marked ‘A’ through ‘D’ in the figure. This arrangement can be used to replace the LED arrangement at points A, B, C, and D. This 74LS154 IC is a decoder/ demultiplexer that senses the output of IC2 and accordingly activates only one of its 16 outputs in accordance with the count value. LEDs at the output of this IC can be arranged in a circular way along side the corresponding voltages. When the power is switched on, IC2 resets itself, and hence the output at pins 6, 11, 14, and 12 is equivalent to binary zero, i.e. ‘0000’. The corresponding DC output of the circuit is minimum (1.25V). As count-up switch S1 is pressed, the binary count of IC2 increases and the output starts increasing too. At the highest count output of 1111, the output voltage is 15.19V (assuming the in-circuit resistance of preset VR2 as zero). Preset VR2 can be used for trimming the output voltage as desired. To decrease the output voltage within the range of 1.25V to 15.2V, count-down switch S2 is to be depressed. Notes. 1. When relay contacts across a particular resistor are opened, the corresponding LED glows. 2. The output voltages are shown assuming the in-circuit resistance of preset VR2 as zero. Thus when the in-circuit resistance of preset VR2 is not zero, the output voltage will be higher than that indicated here. Corrugated copper cables are designed to withstand bending with no change in properties. Low-density foam- and air-dielectric cables generally have a minimum bending radius of ten times the cable diameter. Super flexible versions provide a smaller allowable bending radius. Rigid transmission lines will not tolerate bending. Instead, transition elements (elbows) of various sizes are used. Individual sections of rigid line are secured bymultiple bolts around the circumference of a coupling flange. When a large cable must be used to meet attenuation requirements, short lengths of a smaller cable (jumpers or pigtails) can be used on either end for ease of installation in low-power systems. The trade-off is slightly higher attenuation and some additional cost. The tensile strength of a cable is defined as the axial load that may be applied to the line with no more than 0.2% permanent deformation after the load is released. When divided by the weight per foot of cable, this gives an indication of the maximum length of cable that is self-supporting and therefore can be readily installed on a tower with a single hoisting grip. This consideration usually applies only to long runs of corrugated line; rigid line is installed one section at a time. The crush strength of a cable is defined as the maximum force per linear inch that can be applied by a flat plate without causing more than a 5% deformation of the cable diameter. Crush strength is a good indicator of the ruggedness of a cable and its ability to withstand rough handling during installation. Cable jacketing affords mechanical protection during installation and service. Semiflexible cables typically are supplied with a jacket consisting of low-density polyethylene blended with 3% carbon black for protection from the sun’s ultraviolet rays, which can degrade plastics over time. This approach has proved to be effective, yielding a life expectancy of more than 20 years. Rigid transmission line has no covering over the outer conductor. For indoor applications, where fire-retardant properties are required, cables can be supplied with a fire retardant jacket, usually listed by Underwriters Laboratories. Note that under the provisions of the National Electrical Code, outside plant cables such as standard black polyethylene-jacketed coaxial line may be run as far as 50 ft inside a building with no additional protection. The line can also be placed in conduit for longer runs. Low-density foam cable is designed to prevent water from traveling along its length, should it enter through damage to the connector or the cable sheath. This is accomplished by mechanically locking the outer conductor to the foam dielectric by annular corrugations.Annular or ring corrugations, unlike helical or screw-thread-type corrugations, provide a water block at each corrugation. Closed-cell polyethylene dielectric foam is bonded to the inner conductor, completing the moisture seal. A coaxial cable line is only as good as the connectors used to tie it together. The connector interface must\ provide a weatherproof bond with the cable to prevent water from penetrating the connection. This is ensured by the use of O-ring seals. The cable connector interfacemust also provide a good electrical bond that does not introduce a mismatch and increase VSWR. Good electrical contact between the connector and the cable ensures that proper RF shielding is maintained. Both peak and average power ratings are required to fully describe the capabilities of a transmission line. 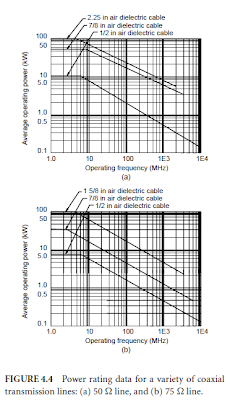 In most applications, the peak power rating limits the low frequency or pulse energy, and the average power rating limits high-frequency applications, as shown in Fig. 4.4. From this equation, it can be seen that 100% amplitude modulation will increase the peak power in the transmission line by a factor of 4. Furthermore, the peak power in the transmission line increases directly with VSWR. The peak power rating is limited by the voltage breakdown potential between the inner and outer conductors of the line. The breakdown point is independent of frequency. It varies, however, with the line pressure (for an air-dielectric cable) and the type of pressurizing gas. The average power rating of a transmission line is limited by the safe, long-termoperating temperature of the inner conductor and the dielectric. Excessive temperatures on the inner conductor will cause the dielectric material to soften, leading to mechanical instability inside the line. The primary purpose of pressurization of an air-dielectric cable is to prevent the ingress of moisture. Moisture, if allowed to accumulate in the line, can increase attenuation and reduce the breakdown voltage between the inner and outer conductors. Pressurization with high-density gases can be used to increase both the average power and the peak power ratings of a transmission line. For a given line pressure, the increased power rating is more significant for peak power than for average power. High-density gases used for such applications include Freon 116 and sulfur hexafluoride. An adequate safety factor is necessary for peak and average power ratings. Most transmission lines are tested at two or more times their rated peak power before shipment to the customer. This safety factor is intended as a provision for transmitter transients, lightning-induced effects, and high-voltage excursions resulting from unforeseen operating conditions. Controlling those high-frequency pulses, with their fast rise and fall times, is tougher and stresses the components a lot more than did low-speed linear circuits. The fast pulses with high-voltage peaks punch holes in transistors’ substrates, and the rapid charging and discharging of filter capacitors wears those out too. Consequently, switchers fail significantly more often than do linear supplies. Nonetheless, very few products still use the old technology; switchers are everywhere, from computer supplies to little AC adapters and chargers for cameras and cell phones. Most switchers fail from bad electrolytic capacitors, blown rectifiers or a dead chopper transistor. Look at the capacitors first. Any bulges? Change them. Leakage? Change them. Anything at all unusual about their appearance? Change them! Checking the rectifiers is easy enough if they’re separate diodes. When you have a bridge rectifier, with all four diodes in one package, each diode must be tested as if it were a separate part. Take a look at the bridge rectifier diagram. With all power disconnected and the big electrolytic near the bridge discharged, desolder the bridge from the board and use your DMM’s diode function to test each diode in it. You should see around 0.7 volts drop at each diode in the forward direction and an open circuit in the reverse direction, as with any silicon diode. If you find an open or a short in any of the diodes, replace the bridge. The chopper is the big transistor, probably heatsinked, on the primary side of the transformer. Some choppers are bipolar transistors, but most are power MOSFETs. If the fuse is blown, it’s a good bet the chopper has shorted out. The transistor can fail open, too, in which case the fuse might still be good. The transistor may have shorted and then opened, and the fuse may or may not have survived the momentary overcurrent. It’s an old technician’s anecdote that transistors are there to protect fuses! Check the chopper using the out-of-circuit techniques. If you have an isolation transformer, you can do some powered tests before pulling parts. Check the voltage across the big cap on the primary side of the supply, near the chopper. Remember that you can’t use circuit ground on this side. The negative terminal of the cap will be your reference point, where you’ll connect the meter’s black lead. You should see at least 300 volts. If it’s much less, suspect a bad bridge rectifier. If it’s zero, the fuse is probably blown, which could mean a bad bridge, a shorted cap or a bad chopper. It’s best not to try to scope the chopper directly, as the voltages are very high. The safer approach is to scope the secondary side of the transformer, using normal circuit ground. Many switchers have multiple taps on the secondary winding. Any of them will do, as long as it’s not the one connected to circuit ground. If the chopper is running, you’ll see pulses at a significantly lower voltage than what’s on the other side. They won’t be tiny, though. Expect anything from 10 to perhaps 60 volts from the baseline to the peak. No pulses? She ain’t running. If the chopper is good but isn’t running, suspect the pulse-width modulator (PWM) chip or the regulation circuitry near the output. Open zener diodes on the secondary side can allow the output voltage to rise too high, activating protection circuitry and shutting down the PWM, or even tripping the crowbar, deliberately blowing the fuse. No pulses, no chopper, no operation. If the supply is running but not putting out proper power, caps on the secondary side are the primary suspects. Scope them. If you see much of anything but DC on an electrolytic that has one lead going to ground, change it. Either its capacitance has declined, its ESR has risen, or both. If you change the cap but the waveform still looks noisy, look for a leaky diode feeding the cap. Finally, remember that most switchers will shut down if output current demand exceeds their safe limits. Some may blow their fuses for the same reason. A short somewhere else in the machine may be pulling too much current and causing the supply to act like it’s broken. This circuit uses a complementary pair comprising npn metallic transistor T1 (BC109) and pnp germanium transistor T2 (AC188) to detect heat (due to outbreak of fire, etc) in the vicinity and energise a siren. The collector of transistor T1 is connected to the base of transistor T2, while the collector of transistor T2 is connected to relay RL1. 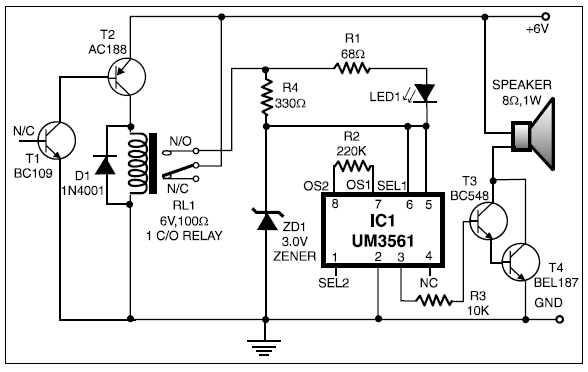 The second part of the circuit comprises popular IC UM3561 (a siren and machine-gun sound generator IC), which can produce the sound of a fire-brigade siren. Pin numbers 5 and 6 of the IC are connected to the +3V supply when the relay is in energised state, whereas pin 2 is grounded. A resistor (R2) connected across pins 7 and 8 is used to fix the frequency of the inbuilt oscillator. The output is available from pin 3. Two transistors BC147 (T3) and BEL187 (T4) are connected in Darlington configuration to amplify the sound from UM3561. Resistor R4 in series with a 3V zener is used to provide the 3V supply to UM3561 when the relay is in energised state. LED1, connected in series with 68-ohm resistor R1 across resistor R4, glows when the siren is on. To test the working of the circuit, bring a burning matchstick close to transistor T1 (BC109), which causes the resistance of its emitter-collector junction to go low due to a rise in temperature and it starts conducting. Simultaneously, transistor T2 also conducts because\ its base is connected to the collector of transistor T1. sound of a firebrigade siren. Lab note. We have added a table to enable readers to obtain all possible sound effects by returning pins 1 and 2 as suggested in the table. This small circuit, based on popular CMOS NAND chip CD4093, can be effectively used for protecting your expensive car audio system against theft. When 12V DC from the car battery is applied to the gadget (as indicated by LED1) through switch S1, the circuit goes into standby mode. LED inside optocoupler IC1 is lit as its cathode terminal is grounded via the car audio (amplifier) body. As a result, the output at pin 3 of gate N1 goes low and disables the rest of the circuit. Whenever an attempt is made to remove the car audio from its mounting by cutting its connecting wires, the optocoupler immediately turns off, as its LED cathode terminal is hanging. Different values of capacitor C2 give different ‘on’/‘off’ timings for relay RL1 to be ‘on’/‘off’. With 100μF we get approximately 5 seconds as ‘on’ and 5 seconds as ‘off’ time. Gate N4, with its associated components, forms a self-testing circuit. Normally, both of its inputs are in ‘high’ state. the security circuit is intact. This ‘on’ period of buzzer can be varied by changing the values of capacitor C1 and/or resistor R5. After construction, fix the LED and buzzer in dashboard as per your requirement and hide switch S1 in a suitable location. lead terminal. 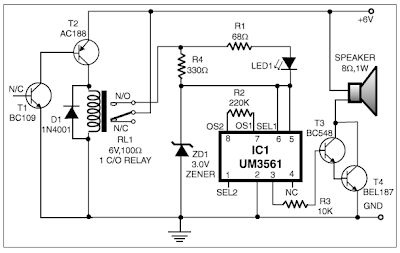 Take power supply for the circuit from the car battery directly. A photodiode can be regarded as a high-impedance non-ohmic photosensitive device whose current is almost independent of applied voltage. The incident light falls on a reverse-biased semiconductor junction, and the separation of electrons from holes will allow the junction to conduct despite the reverse-bias. Photodiodes are constructed like any other diodes, using silicon, but without the opaque coating that is normally used on signal and rectifier diodes. The junction area may be quite large, so the photodiode may have more capacitance between electrodes than a conventional signal diode. 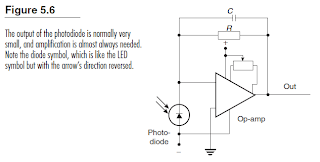 This can be compensated by using a feedback capacitor in the circuit, illustrated in Figure 5.6, which shows a typical circuit for using a photodiode along with an operational amplifier for a voltage output. The feedback resistor R will determine the output voltage, which will be RI, where I is the diode current. • Some LEDs can be used as photodiodes with peak sensitivity values in the infra-red or in the visible spectrum, and in some circuits it can be convenient to use the same device as both a receiver and an indicator. Characteristics for photodiodes specify the output current into a short circuit, and the current will be much lower into a resistance of appreciable value. The sensitivity can be quoted in terms of incident light measurements, but Table 5.2, shows, more usefully, the output of some types when the incident light is provided by various typical sources. 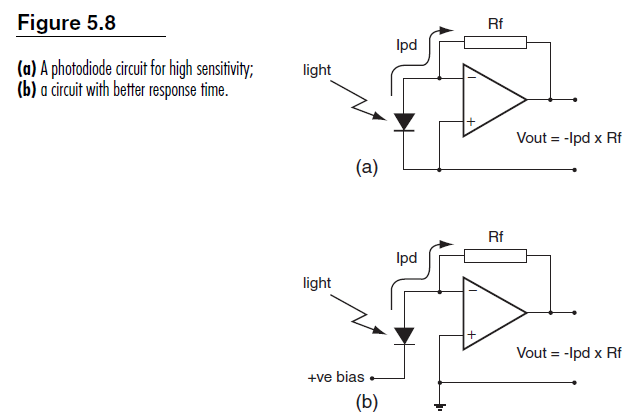 Figure 5.8 shows typical circuits using a photodiode using an operational amplifier as a load. The circuit in (a) is used for high sensitivity and operation down to DC levels. The circuit in (b) is preferred when speed of response is preferred to operation at very low frequencies. Schottky diodes are named for their discoverer, the physicist Walter Schottky. A Schottky diode consists of a metal-semiconductor junction, in which the semiconductor is usually silicon, and the metal can be, typically, silver, aluminium, gold, chromium, nickel, platinum or tungsten, or alloys of exotic metals. The diode conducts using majority carriers, so that the forward drop is small, only about 0.2 V compared to the 0.6 V of a silicon diode. In addition, the diodes have very fast switching times, meaning that when the voltage is switched off the current also turns off with only a very small delay. This feature makes the Schottky diode useful in RF applications such as RF demodulation and in high frequency switch-mode power supplies. Because of the low voltage drop, the diodes also make excellent power rectifiers, particularly for high-frequency supplies, though the reverse current is too high for some applications. Figure 5.4a shows the relevant symbol. Schottky diodes are also used embedded into ICs (see later) in logic circuits, and as part of complex devices ranging from photodiodes to MOSFETs. Silicon carbide Schottky diodes are now being used for high-current diodes with very high voltage ratings (up to 1200 V). 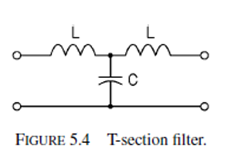 Wave filter circuits are networks that contain reactive components (typically L and C) that accept or reject frequencies above or below stated cut-off frequency limits which are calculated from the values of the filter components. Output amplitude and phase vary considerably as the signal frequency approaches a cut-off frequency and the calculations that are involved are beyond the scope of this book. The use of computer simulation, is advisable when designing such circuits. Much more easily predictable responses can be obtained, for audio frequencies at least, by using active filters . Quartz crystals are used extensively in filter circuits to provide very sharp cut-off points, and in these applications the frequency–temperature characteristic of the devices is the most important parameter. This leads to the use of AT-cut crystals as the preferred type, providing very good frequency stability over a wide temperature range. Ceramic resonators, using materials such as lead zirconate titanate (PZT) are extensively used in filter circuits, and in microprocessor timing applications. These materials are piezoelectric, and can resonate in several modes depending on their resonance frequency. Their precision of oscillation is lower than that of quartz crystals, but very much better than a discrete LC circuit, with a temperature coefficient of around 10−5/◦C in a temperature range of, typically, −10◦C to +80◦C. They are considerably lighter and smaller than quartz crystals, and relatively immune to alterations on loading or in power supply voltage. Ceramic resonators in SM format often have load capacitors built in; other configurations may require load capacitors to be added. 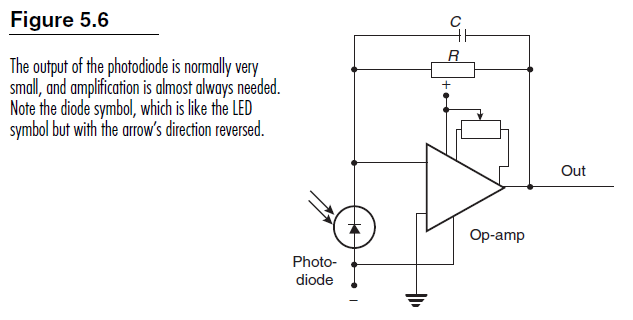 Although reverse breakdown of a diode is a departure from its rectifying action, practical use can be made of this effect. If a diode is supplied with reverse current from a current source with a sufficiently high voltage capability (>|BV|), the diode voltage is substantially constant over a wide range of current. The diode, now used as a breakdown (or Zener) diode, has wide application in providing stabilized voltages ranging from 2.7 V to 200 V or more. A breakdown diode is characterized by its nominal breakdown voltage and the reciprocal of the reverse characteristic in the reverse region, the dynamic slope resistance (rz). An ideal breakdown diode has a well specified breakdown voltage and zero slope resistance giving a constant reverse voltage (in breakdown) indepen dent of temperature and reverse current. In practice, however, the breakdown characteristic is curved in the low reverse current region and the reverse current supplied must be of sufficient magnitude to ensure that the breakdown diode operates beyond the knee of the characteristic in a region of low slope resistance. Further, even beyond the knee, slope resistance varies with reverse current and depends on the nominal breakdown voltage and temperature. Manufacturers’ data should be consulted for accurate figures. In general, rz is a minimum for devices with a |BV| of approximately 6 V and operated at high reverse currents. At lower currents and for both higher and lower values of |BV|, rz increases. The temperature coefficient of breakdown voltage depends on both the nominal breakdown voltage and on the reverse current. Below approximately 5 V the temperature coefficient is negative and above is positive. This is because different breakdown mechanisms occur for low and high breakdown voltages. At approximately 5 V both mechanisms are present and produce a zero temperature coefficient. The device rating which is important for a breakdown diode is the power dissipation, the product of reverse current and breakdown voltage. Various efforts to improve the signal-to-noise ratio in channels with additive noise and intersymbol interference, which is characteristic of severely bandlimited channels (e.g., the telephone channel), led to the original development of set partitioning techniques that culminated in Ungerboeck’s development (1982) of trelliscoded modulation (TCM). Ungerboeck showed how large Hamming distance between differing data sequences does not necessarily imply large Euclidean distance between modulated data sequences, unless the assignment of coded signals to modulated signals is cleverly made. He proposed a new method of set partitioning,which not only provided a method for the assignment of coded signals to channel signals, but also provided a simple formula for the lowerbound of the Euclidean distance between modulated data sequences. The trellis code replaces the QPSK signal constellation with an 8-ary PSK signal constellation so as to introduce eight points in the complex plane that represents phase modulation. Instead of using the eight points to increase the data rate by modulating three bits at a time into a channel symbol, the trellis code modulates only two bits of data at a time into a three-bit channel symbol. The three code bits define one of eight possibilities that are labeled in the phase diagram. Every pair of incoming data bits is mapped into three code bits by the trellis encoder in order to create a waveform. The transmitted trellis-coded waveform has the same data rate as a QPSK waveform and uses the same bandwidth, but the power requirement is reduced by 2.5 times. TCM can also be used to increase the transmitted data rate at a fixed transmitted power. Much more complicated signal constellations are required for this purpose. Most of the fluid level indicator circuits use a bar graph or a seven-segment display to indicate the fluid level. Such a display using LEDs or digits may not make much sense to an ordinary person. The circuit presented here overcomes this flaw and displays the level using a seven-segment display— but with a difference. It shows each level in meaningful English letters. It displays the letter E for empty, L for low, H for half, A for above average, and F for full tank . The circuit is built using CMOS ICs. CD4001 is a quad. 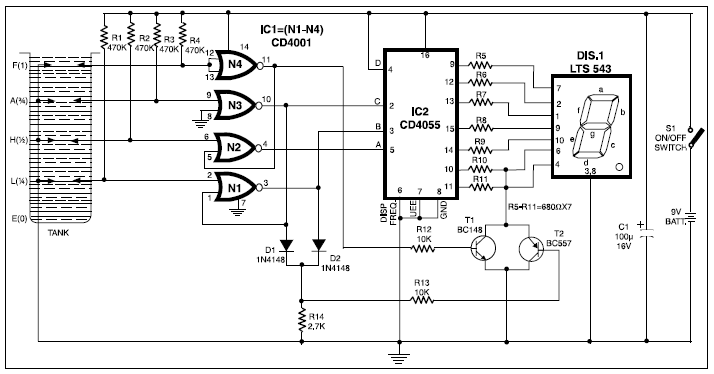 NOR gate and CD4055 is a BCD to seven segment decoder and display display driver IC. This decoder IC is capable of producing some English alphabets besides the usual digits 0 through 9. The BCD codes for various displays are given in Table I. The BCD codes are generated by NOR gates because of their interconnections as the sensing probes get immersed in water. Their operation being self-explanatory is not included here. Note that there is no display pattern like E or F available from the IC. Therefore to obtain the pattern for letters E and F, transistors T1 and T2 are used. These transistors blank out the unnecessary segments from the seven-segment display. It can be seen that letter E is generated by blanking ‘b’ and ‘c’ segments of the seven-segment display while it decodes digit 8. Letter F is obtained by blanking segment ‘b’ while it decodes letter P.
As CMOS ICs are used, the current consumption is extremely low. This makes it possible to power the circuit from a battery. The input sensing current through the fluid (with all the four probes immersed in water) is of the order of 70 μA, which results in low rate of probe deterioration due to oxidation as also low levels of electrolysis in the fluid. Note: This circuit should not be used with inflammable or highly reactive fluids.